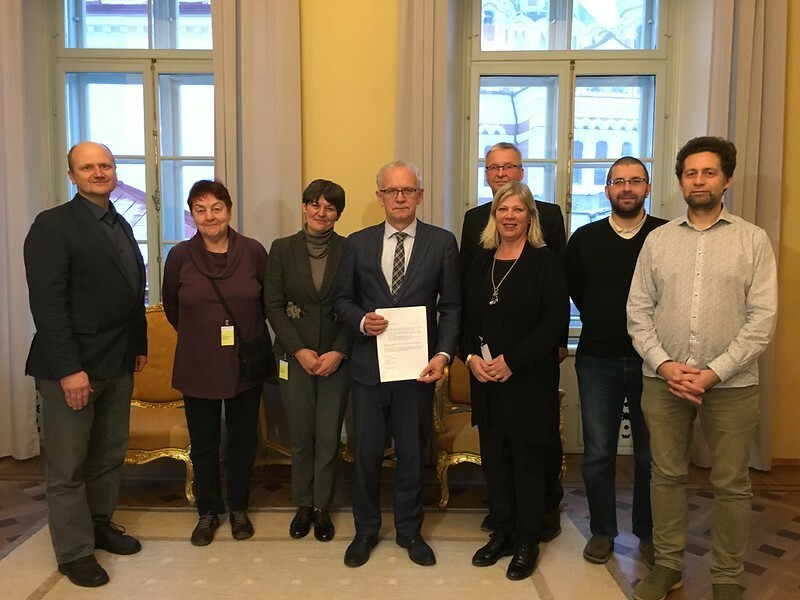 On 29 November a delegation from the civil society organisations Estonian Heritage Society, led its Vice-chair Helle Solnask, and SA Kalaranna Patarei presented the petition “Save Patarei” to Eiki Nestor, Speaker of the Estonian Parliament. The petition was signed by over 1,000 Estonian citizens, who expressed their concerns for the future of the Patarei Sea Fortress, listed among the 7 Most Endangered heritage sites in Europe in 2016. Sneška Quaedvlieg-Mihailovic, Secretary General of Europa Nostra, was with the representatives from the organisations at the Estonian Parliament as they presented the petition. The petition lists actions to be taken in order to stop the national monument from falling apart and suggests multi-functional uses for Patarei. The meeting with the Speaker proceeded in a positive and friendly atmosphere. Eiki Nestor was impressed by the large public interest in Patarei Sea Fortress, especially coming from elsewhere in Europe. Helle Solnask, Vice-chair of the Estonian Heritage Society, explained to Eiki Nestor the reason why the civil society organisations started this initiative and the concerns that people have. The Speaker was aware of the endangered state of Patarei and also of its significance in Estonian and European history. Sneška Quaedvlieg-Mihailovic assured the Speaker that people elsewhere in Europe also value Patarei both for its architecture and for its role in history. She stressed that such a monument is a great asset to Tallinn. Its location by the sea and proximity to the Old Town of Tallinn offers various possibilities. “We would not like to see this extraordinary architectural complex simply privatized and used for purely commercial functions. Together with Estonian civil society organisations, we believe that with imaginative and creative cooperation between the public and the private sector, this site could have a multi-functional future”, stated the Secretary General of Europa Nostra in an interview to Tallinn TV. Eiki Nestor agreed that the future of Patarei depends largely on the will of all parties to cooperate. The petition will be discussed at the Committee of Culture of the Estonian Parliament in the near future. Earlier this year Europa Nostra and European Investment Bank Institute met with Jaak Aab, Minister for Regional Development, who is charged with securing a future for the site. The Patarei Sea Fortress is in state ownership and has been managed for over 10 years by State Real Estate Company (RKAS). The Minister assured Europa Nostra that although Patarei is a very costly project, it is a national monument and will be protected as such. Its future requires, first and foremost, a political decision, and Minister Aab will bring the case forward to be discussed in the government. All options should be considered. There is very strong public interest and the government’s task is to find the best possible way to save and renovate Patarei. On 5 December the Minister for Regional Development presented “the best possible option” to the government: a proposal to sell Patarei to a private developer by public tender. The restoration of Patarei is estimated to cost around 50 – 100 million euro. The Minister said that the state does not have such funds. Therefore the best option, in Minister Aab´s opinion, is to find a private developer who could invest in Patarei. So far, according to Minister Aab, the process of selling Patarei has progressed slowly and has been unsuccessful due to the insufficiently developed infrastructure of the area. Now, a new zoning plan is ready to be approved, which will create more favourable conditions. The plan proposes, among other things, to build multi-storied houses in the immediate vicinity of Patarei. According to the Minister, this plan was presented to the government with the best interests of the public at heart. The petition “Save Patarei” is now waiting to be discussed in the Parliament. The Estonian Heritage Society along with other local heritage NGOs and Europa Nostra hopes that the European Year of Cultural Heritage in 2018 will prove to be a year when the voice of civil society will not only be heard, but that it will be listened to by the decision-makers in Estonia. On 11 December the Estonian Heritage Society will celebrate its 30th anniversary. It is therefore one of the oldest civil society organisations in Estonia that has been continuously active throughout its 30 years. Patarei and the struggle for its dignified future will be a defining part of its anniversary celebrations, especially now that such a large public has clearly demonstrated its support.